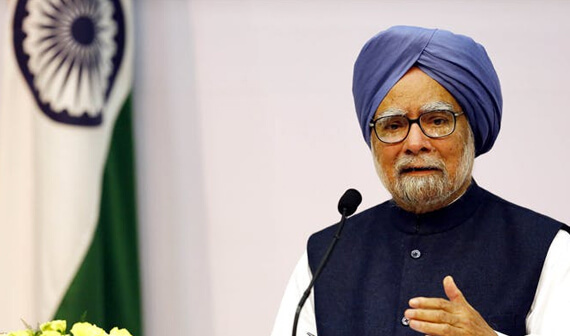 Dr Manmohan Singh, India’s 14th Prime Minister, presided over a decade of phenomenal growth and development. Under Dr Singh’s stewardship, India witnessed the highest growth rate in its history, averaging at 7.7% to become a nearly two trillion-dollar economy. India was catapulted from tenth position when Dr Singh took over into the world’s third largest economy by 2014, raising the living standard of millions. It is this period that launched India on its path to economic superpower status and also burnished Dr Singh’s credentials as an innovative thinker and administrator. However, the foundations of Dr Singh’s beliefs and his dedication to public service can be traced back to his early twenties and the very beginning of his career. Dr Manmohan Singh was born on September 26, 1932 in Punjab. He received his Bachelor’s and Master’s in Economics from Panjab University in 1952 and 1954 respectively. He completed his Economic Tripos from Cambridge University in 1957. He followed this with a D.Phil in Economics from Oxford University in 1962. Dr Singh went on to teach at Punjab University and the Delhi School of Economics. He joined the Government of India as Economic Advisor in the Commerce Ministry in 1971. He was soon promoted to Chief Economic Advisor in the Finance Ministry in 1972. After a short stint at the UNCTAD Secretariat, he was appointed Secretary General of the South Commission in Geneva from 1987-1990. In addition, Dr Singh also held the positions of Secretary in the Finance Ministry, Deputy Chairman of the Planning Commission, Governor of the Reserve Bank of India, Advisor to the Prime Minister and Chairman of the University Grants Commission. Dr Singh has been a Member of the Rajya Sabha since 1991, where he was Leader of the Opposition from 1998-2004. Following, the Congress Party’s historic wins in 2004 and 2009, he took the Office of Prime Minister on 22nd May, 2004 and again on 22nd May, 2009. Dr Singh’s commitment to development and his many achievements have been recognized through the many honours that have been conferred upon him. These include the Padma Vibhushan in 1987, the Euro Money Award for Finance Minister of the Year in 1993, the Asia Money Award for Finance Minister of the Year in both 1993 and 1994 and the Jawaharlal Nehru Birth Centenary Award of the Indian Science Congress in 1995. However, Dr Manmohan Singh is known not only for his vision that led India to become an economic powerhouse but also for his hard-work and his humble, soft-spoken demeanor. He is a Prime Minister who will be remembered not only for the leaps and bounds by which he took India forward but also as a man of thought and of integrity.